The reactions were mixed. Some were exuberant, some were unsure and some were critical against the goodies that was handed out in the 2013 Budget. A recap of the goodies under the 2013 Budget are as follows; RM250 cash payment to single citizens above 21 earning less than RM2,000 monthly, RM500 cash payment to households earning below RM3,000 monthly under the BR1M 2.0, cash payment of RM1—to all primary and secondary school students, and a one-off rebate of RM200 to be given to youths aged between 21 to 30 years old to purchase smart phones. The idea to alleviate the staggering cost of living of Malaysians by handing out cash goodies seemed like a good idea at the time. But the question is; is the government helping to alleviate the monetary burderns of Malaysian citizens or is the Malaysian government buying the votes of the Malaysian citizens? Nevermind those two questions, the subquestion to those two main questions is whether the cash goodies are sustainable against the Malaysian economy or is it not? Whilst the sub-sub question that remains to be answered is whether there are other ways to alleviate the monetary burderns of Malaysian citizens other than handing out cash goodies. The proverb “Give a man a fish and he will eat for a day, teach a man to fish and he will eat for a lifetime” is something to ponder. The theme for the 2013 Budget was Prospering The Nation, Enhancing Well-Being Of The Rakyat: A Promise Fulfilled. But how does handing out cash goodies enhance the well being of the rakyat other than it is a temporary high with no long lasting positive effects for the Malaysians citizens. In his speech, Prime Minister Najib Tun Razak quipped that the RM200 cash rebate for a smart phone purchase was to enable the youths to access the internet. Yet does it lead to the wiser use of the internet by the youths? Cash handouts may be a plausible good way to a temporary high but it is also pertinent to gather an understanding on the alternatives to a cash handout. One of the many other alternatives than a cash handout is the possibility of introducing a free college education for all in Malaysia or revolutionize the idea of the need of a higher education degree. A Harvard professor, Peter Theil has a view that higher education is broken and that many kids would be better off saving their money and going straight from high school into a trade or developing a business. Under his “20 under 20” fellowship grant, high school students with a sound business idea will be given a grant worth USD$100,000 if they skip college and go right to work their idea. Meanwhile, entrepreneur Vivek Wadhwa believes that online courses will revolutionize higher education and cut the cost to near zero for students over the next decade. While both ideas are radical and could change the education plateau on Malaysia. Wadhwa and Theil has provided us with a window that provides the youth and students alike to choose their future instead of the narrow path of college or dropping out and work an employment with minimum wage. The other alternative as can be seen in Sweden is to provide not only free higher education but a free and quality assured higher education. Sweden until 2011 had introduced tuition fees for foreign students from outside the European Union (EU) and European Economic Area (EEA). But, on the other foreign students who cannot afford to pay foe the tuition fees may be eligible for countries in which Sweden has long-term development projects and for foreign students outside the EU/ EEA. The question many quarters may forwards is the sustainability of such policy. In Sweden, 85 percent of the funding of Sweden’s universities comes from the government, with 65 percent comes from direct government grants. 7 percent comes from other public sources of funding whereas the rest comes from private and financial revenue. Whilst the smartphone rebate allows the youth to surf the internet, it does not teach the youth develop potential internet programming that will revolutionize the internet. There is a stark contrast of education expenditure between Malaysia and Sweden. In 2009, Malaysia spent around 25 percent of our GDP whilst Sweden in the same year only spent 7.29 percent of their GDP on education. Yet in the TIMSSS 2011 report, the average score for mathematics between Sweden and Malaysia are 504 and 440 respectively. In other words, whilst Malaysia is busy spending money on electronic gadgets, the Swedes are spending less money for the lasting quality of their future generations. Is Sweden’s method better than Malaysia’s attempt to bring the internet to the youth by offering a free meal? In Malaysia the government decides what and how should the students learn whereas in Sweden it is the students that decide their own education. Has this worked? For Sweden it has as shown by the results of the TIMSS reports. Amongst the freedom given to students in Sweden was the empowerment given to students to spend more time on subjects of their own choices, compulsory courses in natural and social sciences were no longer divided into separate subjects. The Swedish Education Act also provides that all children and young people are to have equal access to education, regardless of gender, where they live or social or economic factors. Also in 2006, Sweden appointed its first Child and School Student Representative, whose task is to provide information on any discrimation act, assists the schools in preventing bullying, oversees schools’ efforts and represents students who have been bullied. In terms of giving access of the internet to youths, there is an average of six students per computer in town-owned schools and 4.5 students per computer in independent elementary schools. As for high schools, there are 2.5 students per computer in town-owned schools and 1.6 students for every independent high schools. This leads an average of 96 percent of all schoolchildren who have access to a computer and the internet. The bottom line is that in order to give the access of the internet to the youths, the education is to be reformed and not in the manner of the half-baked supposedly refomation of education in the New Education Blueprint that doesn’t provide insurance that all youths in Malaysia will be guaranteed a place in schools much less an all-round good quality education that does not discriminate nor leave behind any student. Just as Malaysian youths cautiously accepted the smartphone rebate, the young adults were optimistically cautious accepting the RM250 cash payment for those above 21 years old and earning less than RM2,000. RM250 may seem peanuts to certain quarters but to a hopefull young adult living in the city trying to make it big, RM250 means two months of food funds. But, does it help in the long run? The federal government introduced the minimum wage of RM900 in Peninsular Malaysia and RM800 in Sabah Sarawak. Whilst the Selangor state government on the other hand introduced the minimum wage of RM1,500 to it’s state employees. Other than donning on the hat of minimum wage or disbursing cash payments, it’s still does not solve the problem of the ridiculous rise in the living standards and the failure of the wage to match that sky-rocketing high living standards. The fact that Malaysians have to resort to be given cash payments as a means to deal with the high living standards does not seem to matter to anyone. Cash payments have in an indirect way poked fun of a persons’ dignity. For not it is of a paltry sum but it is in the form of a cash payout. When one resorts to receiving a cash payment it usually is a sign of desparation. It is a sign of a person questioning their self-worth in the ability to achieve anything. The medicine of the degradation of a person’s dignity is to medicate their degradation of self-worth. The federal government or state government needs to encourage the youth to be active in community causes such as being carried out in Subang Jaya Gotong-Royong of catching rats. It activates a sense of one having the capability of giving back to their community and also increases their self worth. Another community project worth mentioned is the Subang Jaya Book Exchange where people would exchange books (old and new) for free. The endorsements of the authorities may it be the municiple council, state or federal is a positive step to a person not needing cash payment to survive high living standards. Other examples are encouraging community exchange of baby/ children products for families receiving the BR1M cash payment. Such exchange programmes may decrease thei need to receive cash payments as also reduce their burden in facing the high living standards. Endorsement by relevent authorities signals to the poor and marginilized that they do not have to depend of cash payments to face the increasing living standards. They will have the power to empower themselves within a community to better themselves through community projects such was mentioned. States such Australia encourages community based programs as a means to inspire young people to set goals in life and enable the youths to be able to achieve them. Whilst in the United States, community based programs have been fruitful in improving the community’s health that includes both mental and physical health. The American government also uses community based programs as means to engage the locals to promotw healthy, sustainable and green comunities. As according to this agency under the American government, communities must be the driver for local solutions. The point is rather than handing out cash payments, the communities should be given the encouragement to empower themselves so as to not overly depend on governmental monetary assistanse. Instead of handing out cash payments, the government should encourage the community to become independent. The government must teach the people to fish and not how to eat. If information is power, than the power lies within the people of Malaysia to freely gain information concerning decicions made within the office of the Malaysian government. Selangor and Penang both passed a Freedom of Information Bill (FOI). Yet the tenents of the FOI was successfully ignored by the Selayang Municipal Council by not releasing the minute meeting concerning the decicions made on the controversial Dolomite Avenue Park. In order to overcome the power of the dollar sign, one must empower the power of the people. Whilst the FOI enactment is a positif step forward for the socio-political growth of the Malaysian people, it may be wiser to enhance the mechanism. Instead of giving a reasonable access to information, it could be amended to entrenching the right to access information. Instead of limiting the time lapse of twenty years for keeping the information confidential, it should be amended that the time lapse be put away. Another suggested improvement to the FOI enacment was that the government of Penang and Selangor should publish an inventory of the information held by public bodies; appoint and provide adequate training to information officers; undertake routine disclosure of information of public interest; and conduct adequate public awareness activites to ensure that citizens are aware of the law and how to use it. If a government proudly protrays to be a transparent administration, then there should not be any fear to release governmental records to the public. In 2010, the court granted the federal government the right to refuse the disclosure on the water concession signed with the Selangor government and Syarikat Bekalan Air Selangor on the basis such disclosure would affect the daily administration of the government’s machinery and the public interest as a whole. This is a contradiction as courts in other countries have held the denial of access could not be justified and hence it represented a breach of the respective State’s human rights obligations. That being said, what the people need is not cash handouts but empowerment. This right of information has not only be supported in countries such as the US, regions suchs as the EU but also by countries such as India, Sri Lanka and Japan. Yet this basic human right seems to be an alien notion in Malaysia. As opposed to the words of Najib whom guarantees that “Umno is always transaparent as we accept comments and learn to improve ourselves”. Those words do not empower the people. Instead those words are justifications by a government of a sovereign nation to run around the bushes trimming the hedges but not cutting the roots of the thatches. In 2010, Malaysia was tied in the same group as Liberia, Zambia, Albania, Afghanistan, Timor Leste, Mozambique and Mali for states with a poor rating for transparency and accountability in its country’s budget. Even Thailand and Papua New Guinea has a better transparency with regards to it’s budget. They say the pen is mightier than thr sword but in this situation, it is safe to say that information is mightier than the dollar sign. Information gives one the power to change their own future whilst money turns one into a slave of their own creations. Thus making the empowerment through access of information an alternative to cash handouts. To turn Malaysia into a first world state, it takes more than major mega projects to propel Malaysia into that direction. Take for example United Kingdom; the government has published statistics of FOI requests made to the administration since it’s introduction in 2005. 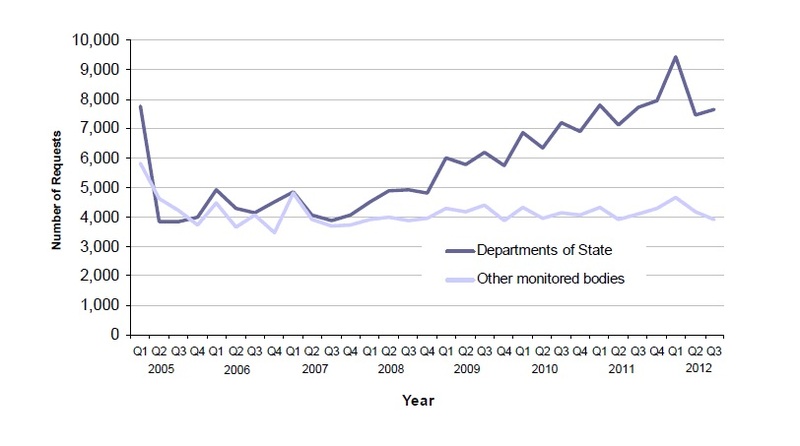 As can be seen in Figure 1, there has been a steady increase in FOI requests from 2007 to 2012. The rise in FOI requests signals that the government of the United Kingdom believes in the power of the people and the people believes in the power of accountability. Meanwhile, in the Philippines, the FOI is facing its’ own hurdles to be passed before the country’s election in May 2013. According to news reports, the FOI bill will entail the full disclosure involving the public interest, subject to certain limitations such as information relating to national security and defence. As the world moves forward and our neighbours are opening their administration to the people that voted for them, it is time for Malaysia to follow suit. Selangor and Penang are swimming with the currents while the Malaysian federal government is doing the exact opposite. The British goverment is a good example of a transparent government. Najib should take heed in doing the same. The Malaysian Federal and State government should make it mandatory that statistical data for requests for information be made public as a measure of proactive transparency. Once a government, may it be either the federal or state government move beyond the notion the idea of the government owning information and allows the people to access it to the notion that the government holds information on behalf of the people, who have the right to access it, than the wish to access information by the people should not be of a negative notion. The act of the Najib administration in handing out monetary goodies to Malaysians is an act of placing a tiny bandaid on a bleeding stab wound. It fails to medicate the real issues faced by the Malaysian people. It also serves to insult the intelligence of Malaysians. What Malaysians need are ways to improve the community without the help of cash handouts. If the community is happy than the country is happy. If the community is satisfied with it’s own creations than wastage of taxpayers money doesn’t occur through governmental cash handouts. The questions of ways to counter cash handouts lies in the government supporting community based programs that improves both mental and physical well being of the community. Just as supporting the notion of free education and alternatives such as entrepeneur start-up programs for youths who do not wish to continue their tertiary education is an alternatives to rebates to purchase smartphones that doesn’t actually benefit a youth in the long run. Najib seems to forget that the worth of a smartphone depreciates with time but a good education is an investment that lasts a lifetime and more. By placing his trust in money and distrusting the worth of the capabilities of a satisfied community, Najib is mocking the basic rights of the people of Malaysia. And if the recent amount of Malaysian participants in the Himpunan Kebangkitan Rakyat on 12 January 2013 is of any hint, Malaysians seem to be ready to take back their rights and prove than the empowerment of the people is always better than any cash handout.